Have you ever had one of those years where everything seems to be going great and then it suddenly falls apart? That was my last year. Everything was going well until my son got sick. Super sick. After a year, he’s finally recovering. It’s a very slow process, but he’s doing so much better. Then to top it off, we’ve had to fix cars, replace several appliances, and get a new furnace and water heater. Yep, it’s been a year! We’ve learned so much though! We’ve grown closer together as a family and we’ve all grown a lot individually. In this book, things are going well for Angie. She co-owns a business that she loves and is doing great. She has a handsome boyfriend, an amazing daughter, and great friends. And then the business across the street opens and everything starts falling apart. 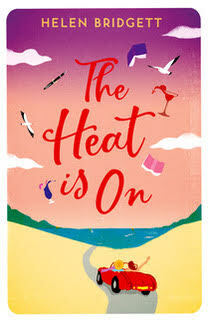 I hope you enjoy my book review of The Heat Is On by Helen Bridgett. “Angie Shepherd is back and this time she means business! Life is perfect for Angie Shepherd. Her dreams of becoming an entrepreneur have come true, business is booming, and her best friend Patty is back in town. So when the opportunity of investing in a luxury hotel comes up, it seems like a no-brainer. It’s all going swimmingly until a rival travel agency opens up across the street. Before long, The Mercury Travel Club is undercut, double-crossed and in deep trouble. It’s time for Angie to up the stakes. But with costs mounting up, sales going down, and her personal life suddenly in freefall, can Angie and her friends weather the storm? Sometimes when everything is going really well it makes me nervous. Ok, this can’t last forever, right? What’s going to happen? It’s easy to get anxious and fearful, but then when something does happen, you realize you’re stronger than you thought. You realize you lived through your nightmare and it’s ok. That’s what Angie has to do in this book. She needs to make it through and come out stronger. I enjoyed this book. It’s a fun, entertaining summer read. I think it’d be perfect for sitting next to the pool or ocean, kicking up your feet, and drinking something cold. This book is well written, has the perfect touch of humor, and has a fun cast of characters. The characters are very well developed. They each have their own identities, personalities, and voices. I thought the author did a good job of bringing them all together. They have their strengths and weaknesses, their talents and flaws, and their good and bad times. As a reader, it makes you feel like you’re one of the gang. They’re realistic and easy to relate to. Most of them are likable too. I don’t know anything about the travel industry, and I kind of didn’t realize that travel agencies still exist. Yes, I hate to admit that I thought people planned their own vacations via Expedia and Hotwire. Or, maybe that’s just me. When my husband and I went on our honeymoon to Cancun twenty years ago (yes, we just celebrated twenty years!) we used an agency, but it’s not there anymore. After reading this book I may need to look and see if there’s one by me. I’d love to relax and let someone else take care of the details. After this year, I need a vacation! The plot, although not action-packed, was interesting enough to keep me reading. There were a few twists and turns, and a few tense moments. The one thing I didn’t like was the title. I still don’t get it? This book also has a lot of spelling and grammatical errors. If you see the publisher, please tell her to call me and I’ll help her out! (Blue Pen Proofreading) It doesn’t really fit the book or its style. I thought it came together well in the end, but I could have used a few extra pages to see how one of the excursions turned out. I want to go to the library in the woods! So much so, in fact, that I did a few quick google searches and found a pic of it. Isn’t it enchanting? It’s a real place! Right now I really wish I could go there! This is a quick, fun read. It’s not based on complex submarine terrorist plots in Russia (like my last read), so it’s kind of a breath of fresh air. It’s easy to read and understand, and is pretty clean. I feel like I have a bunch of new friends, and I definitely have a few places I want to visit now! Disclosure: I did receive a fee copy of this book in exchange for my honest review.